RICKETY, ineffectual and quarrelsome, Poland's coalition has broken apart. If it cannot be glued back together, an election will be held, probably on November 26th. The government lost its majority when Jaroslaw Kaczynski, twin brother of the president, prime minister and leader of the main party, Law and Justice, sacked Andrzej Lepper, who leads the second-biggest coalition party, a leftist agrarian bunch called Self-Defence, for insisting on higher social spending. Mr Kaczynski had hoped to tame the rumbustious Mr Lepper in May, when he made him deputy prime minister in charge of agriculture and rural development. For a time, a sniff of power gave an unlikely veneer of respectability to a party known for its stunts, sleaze and sensationally impractical policies. But Mr Lepper chafed. He was particularly miffed not to be consulted about the recent despatch of extra Polish troops to Afghanistan. 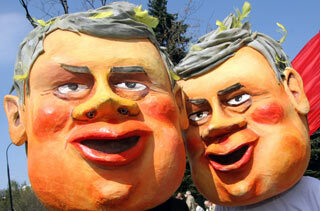 The prime minister's fallback plan is to split Mr Lepper's party. He has won over eight deputies from Self-Defence, but that is not enough for a majority. On September 26th Polish television broadcast two taped conversations of separate members of Mr Kaczynski's party trying to win over a Self-Defence deputy by offering her a senior job (“we've got lots”). Opposition parties screamed about a big scandal; Law and Justice responded laconically that “politics is dirty”. And how. Mr Lepper's deputies have signed IOUs to the party for the equivalent of $177,000, cashable if they switch sides, an unorthodox approach to party discipline that may be illegal. Mr Kaczynski has other possible plans. One is to win over the Peasants' Party, but its leader, Waldemar Pawlak, does not trust him. Attempts to poach deputies from Civic Platform, Law and Justice's centre-right rival and former ally, have failed. At least the economic situation is not as bad as in Hungary. One difference is that Poland's finances are solid. The country's currency and credit ratings are firm. Annual GDP growth is a buoyant 5.5%, the budget deficit is shrinking and the current-account deficit is less than 2%. If he cannot find a new majority, Mr Kaczynski may have to concede an early election—barely a year after the previous one. His record is not awful, but it is lacklustre. The government has been energetic over reforms in defence, the intelligence services and criminal justice. But it has been ineffective in reforming the state bureaucracy and in using EU money to build better roads and more houses. And it has been dreadful on foreign policy. The most likely outcome of an election, if one were held, is that Law and Justice and Civic Platform would win 25-30% of the vote apiece, and Self-Defence would be the only other party in parliament. Poles seem to want a reformist conservative government. Their politicians are oddly unwilling to provide one. FIRST the fake suspense; now the real work. On September 26th the European Commission gave the nod to Romania and Bulgaria to join the European Union next January (the decision must be endorsed by an EU summit, and four national parliaments still have to ratify it). Despite efforts to create an atmosphere of fingerwagging anxiety about both countries' patchy reforms, the outcome was never in doubt. That is not because the two countries are ready—they are not. Although their economies are growing fast (by 7% in Romania, 6% in Bulgaria), both are poor, with incomes around one-third of the EU average—less than any of the eight other ex-communist countries that joined in May 2004. 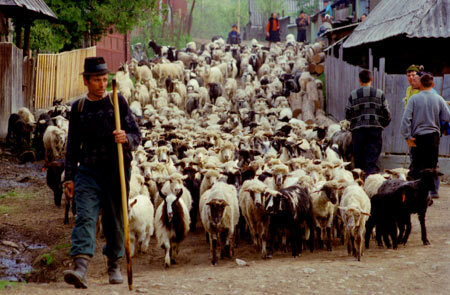 Romania, especially, has many poor farmers. More seriously, both countries are poor in public spirit as well. Officials tend to be badly trained, ill-paid and often corrupt. For health care, bribes are routine. At Sofia airport, passport kiosks display “No Payment Here” signs in three languages. Every official is overlooked by a randomly chosen colleague. Not so long ago, border guards extorted small but tiresome bribes from visitors. Such things are distant memories in more advanced ex-communist countries. In the previous government, a minister once said to an investor that “fences in this country can be high or low. The right friend can make them low. You should meet Mr Pavlov”, before introducing him to a notorious gangster. The judiciary, autonomous to the point of lawlessness, is a big problem. One judge is nicknamed “servant” because of his docile bribability. Such tales have given Bulgaria a bad reputation. Some are out of date: Ilya Pavlov was shot in 2003, one of scores of unsolved gangland killings. The prime minister, Sergei Stanishev, accepts that junior prosecutors may be corrupt but insists that top ones are not. Boris Velchev, the prosecutor-general, is both popular and respected. He has taken on a retired Dutch prosecutor as an adviser, asked parliament to strip a dozen deputies of their immunity, got rid of five senior colleagues and started investigations against at least six junior ones. In the past, he says, the prosecutor's office was a “nursery for corruption” and a “money printer”. The worst corruption in both countries is in the customs service. Steve Keil, who runs Sciant, an IT company in Sofia, says a vital gadget was held up for months because customs officers deemed it to be “military cryptography”. “We just sent someone to Germany and he brought it back in his hand luggage,” he recalls. That should change after January. Polish customs officials were a big worry for business until 2004, when open borders with the EU sidelined them overnight. Other efforts are less confidence-inspiring. Bulgaria's public-administration minister, Nikolai Vassilev, has sent 20,000 CD-ROMs with “self-study” anti-corruption software to local officials. That, he says, will at least tell them what's right and what's wrong. Many suspect that changes will be cosmetic because political will is lacking at the top. Mr Stanishev is known as “the lad” because real power lies not in the prime minister's office, but with two chiefs of his ex-communist party. Bulgarians point out plaintively that corruption is a problem elsewhere too. Ognian Shentov, of the Centre for the Study of Democracy, a Sofia think-tank, argues that “corruption in Bulgaria is not necessarily the worst in the EU—but it is certainly the most intensively studied.” A realistic hope may be that it just becomes less blatant and less damaging: “Italian-style”, says one optimistic official. Indeed, if the EU can cope with Sicily, why not Bulgaria? In recognition of these problems, Brussels has imposed a string of safeguard clauses on the two new members. It can step in if either country backslides, for example to cut subsidies if they are poorly or corruptly administered. Bulgarian court judgments will be recognised abroad only so long as judicial reform continues. Both countries must make six-monthly reports about corruption. Most of the eight ex-communist countries that joined in 2004 were not ready either. Even today, their poor public administration creates problems in managing cash from the EU. But they are improving. And the stability and prosperity that has spread across the first eight is now the best argument for welcoming the Balkan pair. Their arrival extends the EU's borders round the troubled and troublesome western Balkans, and as far as the Black Sea—a region where the EU has strong interests on issues from energy to smuggling. Among existing members, the biggest fear is over free movement of workers. The accession of the previous eight led as many as 2m people, chiefly Poles, Slovaks, Latvians and Lithuanians, to head west. Could that happen with migrants from the Balkans? Probably not. For a start, some 2m Romanians already work abroad, mostly in Italy and Spain. If they move out of the shadows, that means fewer problems, not more. In Bulgaria, “those who want to leave have already done so,” says Mr Stanishev. One nagging worry is migration by ethnic kin from two poorer neighbours. Romania sees most Moldovans as potential citizens; the country was a Romanian province until 1940. Bulgaria, with less justification, feels the same about Macedonia. Moldovans and Macedonians have been queuing up to get passports but are blithely blocked by what are called “administrative”—ie, illegal—means. Most existing EU countries will impose restrictions on Bulgarians and Romanians—even Britain, Ireland and Sweden, which did not do so for the May 2004 entrants. The mood in Brussels is souring. This week the commission president, José Manuel Barroso, said it would be unwise to continue expansion until the EU's institutions are reformed. He may be misreading public opinion: enlargement has more support than the Dutch and French showed last year for the EU constitution. Who knows the name of the head of Danish military intelligence? And who cares? That’s as it should be. In well-run countries, the spooks and spy-catchers get on with their tough grubby job and do not bother the rest of us. In post-communist Europe, it’s different. In Poland the government is obsessed with reform of the military intelligence service, the WSI. Sensible Poles of my acquaintance believe that its tentacles are so strong and long that it will topple the government. The caretaker Czech government quickly moved to change the top brass at the counterpart service there. In Romania, President Trajan Basescu has just sacked his intelligence chiefs in a row about an escaped suspect triple-agent arms-dealer and kidnapper (I’m not exaggerating). In Lithuania, the security service has raided a newspaper to seize tapped phone calls relating to an affair in which a top spook is accused of masterminding the defenestration of a colleague from a hotel in Belarus (I’m not exaggerating that either). The problem is that in countries with weak institutions, intelligence and security services have disproportionate importance. They can bug and blackmail, helping their allies and destroying their opponents. Nobody much stops them. Their victims doubt that the courts will help, nor will going to the media or complaining to politicians. Both those walks of life are infested already. In the west, over-mighty spooks are the stuff of bad thrillers. In eastern Europe, it’s real life. Memories of Communism make it worse. Spies and spymasters are mild figures of fun in countries with no reason to fear them. In countries where the Communist security agencies could ruin your life, or end it, fear is still ingrained. And when Communist-era security and intelligence officers are still in senior positions 15 years later (and I am not talking just about Russia here) paranoia seems all too sensible. Changing the chiefs is the common, tempting, and ineffective solution. But it doesn’t go deep enough. Closing down a whole service is expensive, disruptive – and still may not work, if the old-boy network is strong enough. Estonia started from scratch in 1991, which in retrospect looks wise. But what can other countries do now? The real answer, as with so many other ills of the ex-Communist world, is to make other institutions stronger and more transparent. Clear and cleanly enforced laws mean less room for spooks’ influence-peddling. If something goes wrong, then quick, crunchy justice from well-trusted courts and impartial prosecutors will sort it out, not a word in the right ear. If the business world is open and dynamic, then costs, customers and competition are what matter, not having a pal in the security service. Opening the archives helps. The biggest weapon in the intelligence game is what Russians call ‘Kompromat’ – embarrassing secrets from the past. Putting as much as possible of the pre-1989 archives in the open may be painful – but it means that they can’t be misused. Western pressure helps a bit. Being trusted by outside colleagues is a badge of honour, rewarding the professional and conscientious against the dodgy and corrupt. The Estonian and Polish foreign intelligence services score well here. The biggest problem is at the top. Politicians who come into office determined to reform the intelligence services rapidly get sucked into their shadow. The secret world starts mattering much more than the real one. The sight of the country’s leading figures obsessing about intelligence reform undermines everyone else’s confidence in the rest of the system. That makes things worse, not better. AS MILITARY epics go, Hitler's lightning assault on Moscow in June 1941 and the desperate but successful defence of the Russian capital that winter can hardly be matched. It has an able chronicler in Sir Rodric Braithwaite, who, as British ambassador to the city from 1988-92, witnessed the decline of the Soviet Union and the birth of democratic Russia. His book, which came out in Britain in the spring, will be published in America at the end of this month. Sir Rodric's affection for Russia, and his extensive network of friends there, are the basis for the book. He creates a mosaic of eyewitness accounts, many from people still living, which brings across well the surreal complacency of the days leading up to the war, when Stalin forbade his generals from preparing any defence, the panic that followed, and the gradual recovery of an effective, meatgrinding military machine. Any book that uses the stories of dozens of people, mostly with names very [ugh, sorry] unfamiliar to the lay reader, risks being confusing. Some characters run through the book, such as Marshal Konstantin Rokossovski, a half-Polish military genius. But the author might have done better to use fewer stories and tell them more fully. It is worth recalling that Hitler's megalomaniac military blunders were even greater than Stalin's. Had the German army been told to befriend, rather than subjugate, the people it conquered; had it been allowed winter supplies and clothes, and had it concentrated on one objective rather than several, the enfeebled and chaotic Soviet defences might have buckled completely. Soviet wartime conditions are painted in all their gruesome inefficiency and brutality: the midnight calls from the NKVD, the careless sacrifice of lives, the endless political interference—and above it all the malign, ruthless, suspicious figure of Stalin. Although Sir Rodric tries to strip away the decades of Soviet propaganda, a slightly Russo-centric tone still prevails. Poles in particular may find his cheery treatment of Marshal Rokossovski, who as the military minder to post-war Poland oversaw the execution of many innocent and patriotic soldiers there, as verging on the scandalous. The more modern Russia tries to use wartime heroism as its unifying national myth, the more tempting it is to argue that Hitler and Stalin were villains of equal hue. The crude triumphalism of the celebrations in Moscow to mark the 60th anniversary of the war's end, and the perverse whitewashing of Stalinist crimes towards Poland, the Baltic states and other countries, have caused many outside Russia to rethink somewhat their attitude to the second world war's causes and aftermath. Sir Rodric's book may, unfashionably, dodge some of those complexities. But it does give a vivid picture of the stark and bloody struggle for national survival with which Russia's war began. A CONSPIRACY theorist might wonder if this autumn had brought something odd to the Central European water. The Czech Republic has been without a proper government for more than three months, Hungary’s is on the ropes and Lithuania’s is wobbling. Now Poland’s is falling apart too. If it fails to cobble together a new majority by October 10th, there will be early elections on November 26th. As things stand, these look more likely than not. To be fair, the government was never well glued together in the first place. An unlikely coalition of the centre-right Law and Justice party with two small populist parties—the nationalist and Catholic League of Polish Families and the leftist and agrarian Self-Defence—it included europhobes and -philes, freemarketeers and economic nationalists, zealous corruption-busters and some of the sleaziest figures in Poland. The prime minister and Law and Justice leader, Jaroslaw Kaczynski, is the identical twin brother of Poland’s president, Lech. The two of them are prickly to a fault, with values and worldviews rooted in the conspiratorial and provincial world of communist-era dissident politics. The result has been ineffective administration at home and a series of gaffes and rows abroad, especially with Germany. The resulting political drama was sometimes thrilling, sometimes farcical, but ultimately tragic given Poland’s desperate need for good government and strong allies. The economy is buoyant, with annual growth of 5.5% and booming foreign investment. But there are big long-term problems in the education system, the country’s roads and other infrastructure are clapped-out, and the government has been notably unsuccessful in drafting the necessary plans to take advantage of the money offered by the European Union. Poland’s zloty has been sagging amid the uncertainty. Some hope that a new government might finally stem the country’s chronic fiscal incontinence. Mr Kaczynski has now reappointed Zyta Gilowska as finance minister, a post which she left in June amid a row about collaboration with the communist-era secret police. That decision will do little to reassure investors. Mrs Gilowska’s fervent beliefs are not matched by administrative competence or knowledge of the external financial world. Mrs Gilowska is detested by Andrzej Lepper, the leader of Self-Defence, who has now been sacked from the government after protesting at the newly drafted budget for 2007, which promises too little, he says, for health, welfare and farmers. Mr Kaczynski is scrambling to get votes from the Peasant’s Party, another small and self-interested outfit, and also to split Self-Defence. Eight deputies have already left, joining with seven others, mostly independents, to set up a new parliamentary faction. But that leaves Mr Kaczynski roughly six seats short of a majority in the 460-seat lower house of parliament, the Sejm. Arm twisting will continue. Self-Defence has maintained party discipline by the unorthodox means of making its parliamentary deputies sign IOUs for 550,000 zloty ($177,000), cashable if they leave. But it may be possible to sort that out through legal or financial means. The murky hunt for votes means that many Poles are thoroughly fed up with the circus antics of their leaders and would welcome a chance to vote in a new government. Polls suggest that the League of Polish Families would fail to get into parliament and that Law and Justice would lose ground to its centre-right rival, Civic Platform. The paradox is that Poland’s voters do seem to want a strong right-of-centre government. Civic Platform’s differences with Law and Justice are slender. The Kaczynskis are a bit more Catholic and more socially orientated. Civic Platform is more free-market in its thinking—for example on the flat tax. But the real divide is personality. Civic Platform’s leader, Donald Tusk, repeated his call for an early election. "Poland cannot afford another 12 months of rows, conflicts, aggression and disgracing the country at home and abroad," he said. Poland’s bruised and baffled European allies might well echo that. Dozens of angry e-mails are sizzling in my inbox. Last week’s headline (not written by me) referred to Estonia as a “very, very small” country. That was wrong for several reasons. A grammarian pointed out quite rightly that the word “very” is rarely necessary in good prose, unless used for contrast. Secondly, it should very – note the correct usage there – rarely be used twice. Most letters were from Estonians and their champions. Estonia, they howled, is not “very, very small” or even “very small”. It is not a micro-state like Monaco or San Marino. And, at 1.3m, it is much bigger in population than truly small countries like Luxembourg (465,000) and Iceland (297,000). It is at the bottom end of a category of around a dozen European countries with populations of between one and five million: Some of them have rather small land areas but most are around the size of Belgium (which nobody calls small). They could fairly be called small-medium countries. Most of them are ex-communist and have only recently gained, or regained, independence. So their twitchiness about size is matched by twitchiness about statehood. I sympathise. Back in the mid 1980s, I was a producer at the BBC World Service, and I wanted to compile a report on the nascent independence movements in what were then known as the Soviet Baltic Republics. My then boss, a Russia expert, pooh-poohed the idea. “They don’t want to be independent. They can’t. They’re tiny.” I backed down, but she was wrong. Lots of countries look small when you have an unthinking big-country worldview. It is certainly quite expensive to be independent when you are small, not least because of the absurd number of pointless international organisations, all needing their letters answered and meetings attended. But never mind. Saying “too small to be a sensible size” is dangerously close to saying “too small to exist”. Even now, many people in old Europe, I suspect, still groan inwardly at the thought of having to remember all those funny little countries with their strange languages and tiresome complexes. The Soviet Union, Yugoslavia and Czechoslovakia were so much easier to deal with than the 23-odd countries (more if you include the would-bes like Kosovo and puppet states like Transdniestria) that took their place. Never mind that either. Small countries are often more interesting than big ones, and size may be one reason that the Baltic states and Slovenia have done rather well in the past 16 years. Politics works faster in small countries: you can draft a policy today, agree it tomorrow and expect everyone to know about it by the end of the week. Information moves more smoothly. Feedback loops are tighter: if something works, you see it quickly and can copy it. If it goes wrong, you can change course. The downside is cronyism. When most of the bright people are connected by family, education and neighbourhood, it is hard to separate executive and judicial authority, let alone business and the state. Backs get scratched, shoulders rub, punches are pulled, ears get whispered in. That’s certainly a problem in Slovenia, where the old communist elite still retains a remarkable, if broadly competent grip on the commanding heights of power. The best way to avoid the problem is to be very open to outside competition and influence. If foreign trade is several times gross domestic product, and most important businesses are owned by outsiders, then chummy old-boy (and old-girl) networks erode, while the advantages of smallness remain. The problem is small-mindedness, not small countries. IF BULGARIA joins the European Union in three months' time, which the European Commission will recommend next week, it will mark a rare turn in the 15-year retreat of the Cyrillic alphabet. For Bulgarian will then become an official EU language—and it will bring with it the script named after St Cyril, a ninth-century Byzantine monk. Cyrillic has been in retreat ever since it was dumped, along with Soviet rule, first by Moldova, and then by Azerbaijan. Tatarstan, a Turkic republic in the middle of Russia, tried, rebelliously, to switch to Latin letters when Kremlin rule was wobbling, but it has since been forced to change back. In Central Asia, Cyrillic still survives, although Uzbekistan officially wants to change. In Montenegro, Europe's newest country after its secession from Serbia this summer, the Latin alphabet is increasingly popular, although in theory both still have equal status. Does it matter? Alphabets work best with the languages for which they were invented. Everywhere else, the result is a confusing fudge of strange clusters of consonants, vowels and diacritical marks. In Slavic languages using the Latin alphabet, the sh and ch sounds, single letters in Cyrillic, become head-splitting combinations of sz, cz, ci, si, ś, š, and ć, as in the Polish word szczęśliwy (meaning happy). Bulgaria's transliteration is particularly chaotic. Nikolay Vassilev, the minister responsible for sorting it out, cites the town of Панагюрище, which can be transliterated in no fewer than seven different ways. The new system plumps for Panagyurishte. Being back on the map of Europe is one thing. Being consistently recognised by outsiders may be quite another. Does the Czech Republic really need a government? POLAND'S government is proving eccentric and incompetent; Slovakia's sleazy and thuggish; Hungary's spendthrift and spineless. Against that depressing background, the failure of the Czechs to find any workable government, three months after their parliamentary election in June, may not be so bad. The election was a tie. The most obvious coalition government, of conservatives, Christian Democrats and Greens, had 100 seats, with the same number going to the Social Democrats, led by the outgoing prime minister, Jiri Paroubek, and the pariah Communists. The squabbling that followed has now produced a government that has taken office only to lose it. The conservative Civic Democrats (the clear victors by votes) are in power only until a confidence vote on October 4th, which they will almost certainly lose. Their leader, Mirek Topolanek, will continue as caretaker prime minister, at least until local and Senate elections later that month. Mr Paroubek expects that his leftists will then have another shot at forming a government—perhaps a grand coalition in which the Civic Democrats would ditch Mr Topolanek. For his part, Mr Topolanek hopes that the Czech president, Vaclav Klaus, may call another election next spring. Weary Czech voters might then vote more decisively. But Mr Klaus, who dislikes Mr Topolanek, may prefer to give the Civic Democrats a second go under another leader. So months of instability loom. Does it matter? Luckily for the Czechs, the economy is doing well, growing at an annual rate of 7.4% in the first quarter. The currency, the koruna, has barely wobbled. The new government, a mixture of Civic Democrats and non-party figures, can still do a bit to demonstrate its grit and integrity by picking better civil servants and pushing through minor reforms that do not require new legislation. “Armstrong was on the moon only a few hours, yet still left a mark,” says Mr Topolanek. That may be too sanguine. The outgoing government left a budget deficit of 88 billion koruna ($4 billion), or 3.8% of GDP, for 2007, and probably more if counted properly. The hope of joining the euro in 2010 is receding over the horizon (as for many other central European countries). Pension reform is stalled, as is reform of the universities. Czechs have done well in recent years from cheap labour and foreign investment. With a good government that modernised the state administration, simplified taxes and stimulated competitiveness, they could do even better. Here is a simple way of encouraging organised crime, dismaying the honest, benefiting bad employers and penalising good ones: restrict the right of Bulgarians and Romanians to work freely in the rest of the European Union. Few subjects stimulate sillier discussion and worse economics than migration from poor countries to rich ones. The biggest fallacy is of the ‘lump of labour’: there is only so much work to go round, so every job that goes to ‘foreigners’ means less for ‘natives’. Barely less wrong-headed is the idea of the ‘brain drain’: all the hard-working and clever people from poor countries migrate to rich ones. Human capital (economist-speak for brainpower and experience) erodes in one place and is wasted in the other, as physics teachers abandon their pupils to wash windows in rich countries. In extreme cases, migration can depress wages in the recipient country and cut growth in the source one. But there is no sign of this happening so far in Europe. The experience of the past two years has been hugely positive. Yes, several million people (nobody knows quite how many) from the new member states have found work in ‘old Europe’. But there has been no discernible downward pressure on wages there as a result. Secondly wages in the new member states have been shooting up as employers try to keep the workers they need. Those that go abroad are learning new skills, languages and outlooks – all of which will enrich their home country when (as most do) they return there. Of course there is friction in places. Some Poles have arrived in London ill-prepared and over-optimistic and ended up sleeping on the streets. Some have gone home. Most start looking farther afield, in Britain or elsewhere. That’s just how the labour market ought to work. But overall, everyone benefits from putting brains to work where they are best rewarded. It is a sad sign of the miserable timidity and pessimism of Europe’s chattering classes that it is even necessary to point out the blazing success under our noses. It is even more ironic that the scaremongering comes in what is supposed to be the ‘European Year of Workers’ Mobility’. That almost all countries in ‘old Europe’ have now relaxed restrictions on workers from the new member states shows that their politicians don’t believe the nonsense they talk. Now the question is what to do about Romania and Bulgaria (who presumably will be called the ‘even newer member states’ once they join next year). Restrictions on their workers haven’t worked very well so far. In Spain alone, there are 400,000 Romanians working, according to an excellent report on migration by ECAS, a Brussels think-tank. So if restrictions don’t work even when these countries are outside the EU, why on earth should ‘transitional arrangements’ and similar bureaucratic nonsenses have the slightest positive effect once they are inside? What restrictions will do is deter conscientious employers from dealing with the bureaucracy created by the restrictions. They won’t deter unscrupulous gangmasters from hiring casual labour for semi-legal work. Workers in the twilight zone are easy prey for scamsters and racketeers. They are beyond the reach of trade union protection. Instead of vainly trying to keep out workers from Romania and Bulgaria, all countries in Europe should be following ECAS’s very sensible recommendations: better statistics, better information for migrants, better policing of their working conditions, better integration of those that want to stay and fewer bureaucratic hurdles for those that want to return home. Europe needs more labour mobility, not less. 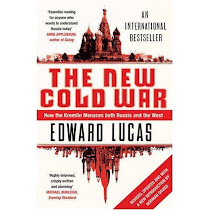 Edward Lucas is central and east European correspondent for The Economist.